Each month, American Speaker brings you loads of advice for developing outstanding presentations. Here are some of the highlights from 2011! If you expect local media to attend your presentation, prepare notes for them, suggests Marty Weintraub, CEO of aimClear and a frequent speaker at industry events. Encourage the media to use those notes to write stories for their publications or to send live tweets during the event. Remember to keep the information free from promotional language about your business or organization. Journalists will toss materials that present a biased viewpoint. — Adapted from “Tips on Being an Effective Speaker by the Experts,” Melissa Fach, Search Engine Journal, http://www.searchenginejournal.com. — Adapted from “11 Unusual Methods for Being a Great Public Speaker,” James Altucher, The Altucher Confidential, http://www.jamesaltucher.com. Set out fewer chairs than you think you will need for your audience. You will gain confidence when you speak to a full house, and if a few extra attendees show up, you can create a “standing room only” impression when you hustle to set out chairs for them. — Adapted from The Productivity Handbook, Donald Wetmore, Random House Reference, http://www.randomhouse.com. Before you accept your next invitation to speak at a conference or trade show, ensure that you can commit to attending the entire event. If you arrive right before and leave right after your time slot, you could offend the attendees, the conference hosts and other scheduled speakers. Show up early and stick around the entire day to prove your commitment to the event, to network and to show respect for the other speakers. — Adapted from “Speaking of … Speaking: Lessons Learned From Hundreds of Presentations,” Jeff Swystun, http://www.business2community.com. Resist the urge to frontload your speech with details of your organization’s history or your credentials. For the first few minutes, the only thing that matters is showing your listeners how listening to you will benefit them. — Adapted from “Improve Your Presentation in Less Than an Hour,” Mark Sincevich, Presentations Magazine, http://www.presentations.com. If you don’t know the answer to a question, say so and offer to find the answer. Suggest to the questioner that you will telephone, email or visit to deliver the answer. Phoning, emailing or visiting can be a good way to make further contact after the presentation. — Adapted from “Handling Questions,” http://www.mypublicspeakingtips.com. Archives of past issues, including the Presenter’s Quick Tips, Speaker’s Briefings, Notable Speeches, Technology You’ll Love and more! A collection of searchable quotes you can use to inspire and engage your audience. The Day in History database, where you will find dates and anniversaries you can weave into your presentations. A humor database with appropriate jokes for every speaking engagement. Free downloads and special reports. Check the site out today! All visitors are welcome to enjoy the tips in free Focus On … section, updated monthly. This multimedia training resource guides you through each step in the process, from creating the perfect presentation to overcoming challenges that might throw you off your game. Commit to learning and implementing the training and you will build your confidence and become an impressive speaker. A binder with over 70 pages of advice on how to prepare and execute your next presentation. The audio conference CD Ensure That Your Message is Heard and Understood: Tips for Communicating Clearly and Concisely with companion PowerPoint presentation. The new video No Sweat! Overcome Your Fear of Public Speaking and Viewer’s Guide. A CD of customizable and print-ready forms. Order today and wow the audience during your next presentation! 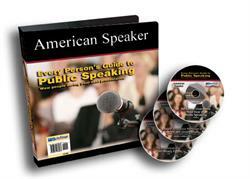 Mastering public speaking is an invaluable skill that will help you succeed throughout your career and life. By attending the American Speaker Training Camp, you will learn essential public speaking skills to expand your persuasive power and personal presence. Click on the following locations to learn how you can participate in this popular two-day workshop! This entry was posted in American Speaker Forum and tagged Communication, persuasiveness, Public speaking, Time management, training. Bookmark the permalink.